I'm not sure if you have noticed, but there seems to be a goal to January's weather pattern, to cover all four seasons in one month. From snow and ice, gusty winds, torrential rain, to sunshine, blue skies, and warmer days, we are seeing it all. The constantly changing weather reminds me of a painting which is pictured above. I hung it up, as the Christmas decorations came down. I was thinking how quickly our Holiday seasons come and go, but little did I realize how appropriate the painting would be for this month of weather extremes. The canvas captures winter, spring, summer, and fall with our Haegele's Bakery logo writing. 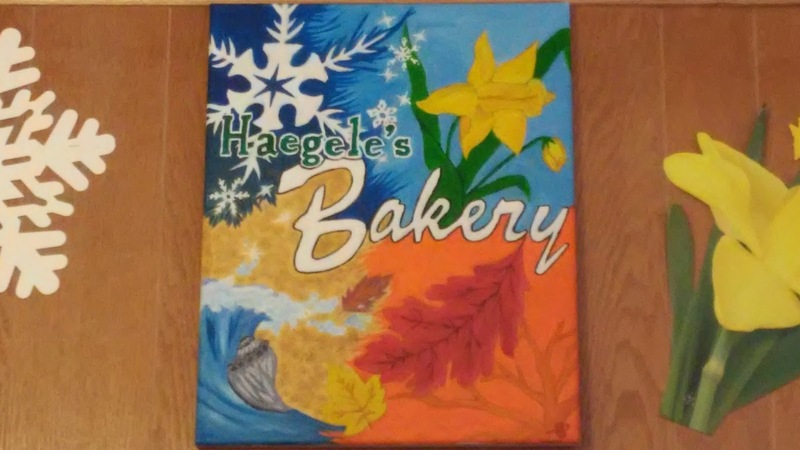 Cleverly titled "Haegele's Bakery For All Seasons", it was given to us as a gift back in 2012. What makes this artwork truly special, is that it was hand painted by one of our own store girls. Brittany worked for us from 2008-2012 and to this day, returns to help out at holidays like Fastnacht. I remember when Brittany came to work for us and I remember when she gave us this painting. None of it seems very long ago.... but as quickly as the seasons change, so do the years pass. One more glance at the painting reveals a cleverly captured message: in the midst of the changing seasons Haegele's Bakery remains the same! Thanks Brit!! !